Loudmouth has been tearing up 1Xtra with his single ‘Name Drop’. He’s also made a massive appearance on Professor Green’s mixtape ‘Lecture’ with a track called ‘Without Trying’. With his album now in the stores and more stuff in the works, Jay Em caught up with the East London artist to find out about what’s up. Easy Loudmouth. First off, how are you? When is the ‘Quality Control’ album droppin’? It’s out now. You can buy it in various record shops in the West End and around London. We’re tryin’ to get it stocked nationally at the moment. You can also buy it online through our MySpace or through some online shops, so check out our MySpace for the links. All good. Who’s on there? Me, Smasher, Mentalist, Fumin (Boundary), Silent, Neeko (Piff City), Tony D (Poisonous Poets), Locksmiff, S.V and Neo. 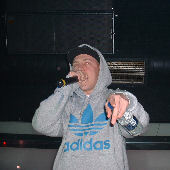 I produced most of it and Mentalist’s brother K-Nite did a few beats, as well as Smasher, Silent, Balistics and Kivanc. Sounds tight man. Speaking of him, how did you hook up with Mentalist? I’ve known Mento for ages now. We’re old friends, so us doing music together is natural and we’re workin’ on an album now that is lookin’ like fire. Cool. Can you drop us any info’ on that or is it all confidential at the moment? As far as features on the album, nothing has been confirmed yet, so I can’t say anything on that, but it won’t have many other artists on there. Production wise, I’m doin’ a lot of it and K-Nite has a few tracks on there too. We might get some beats from other producers, but we haven’t yet. Strong look. When do you reckon you’re gonna drop that one? Probably late autumn or early winter. It’s called ‘Resistance’. Moving on, how did you get started in the scene? Really it was more producin’. I’ve rhymed for a bit but more as a hobby, but I started workin’ with U&I records, who put out ‘Quality Control’. I did beats for them. I did ‘The Biggest’ for Silent. Me and Mentalist got on that and that was my first recordin’ as an artist. So about a year and a half seriously in the scene. Okay. Before we go, you got any shout outs? I’d like to shout out all the artists on ‘Quality Control’ and everyone at U&I records, behind the scenes, who put a lot of work into the album. I also wanna shout out all the DJs like Semtex, 279 and Mistajam who supported us. To all the people that are supporting our music. I’d also like to say go buy the Q.C (Quality Control) album and check out our MySpace. Shout out to Rapnews.co.uk. Bless. For more information on Loudmouth and company, check out the Myspace page now. Posted by Jay Em in Interviews.